Binary Financial are champions of Ball Above All's Elite League. 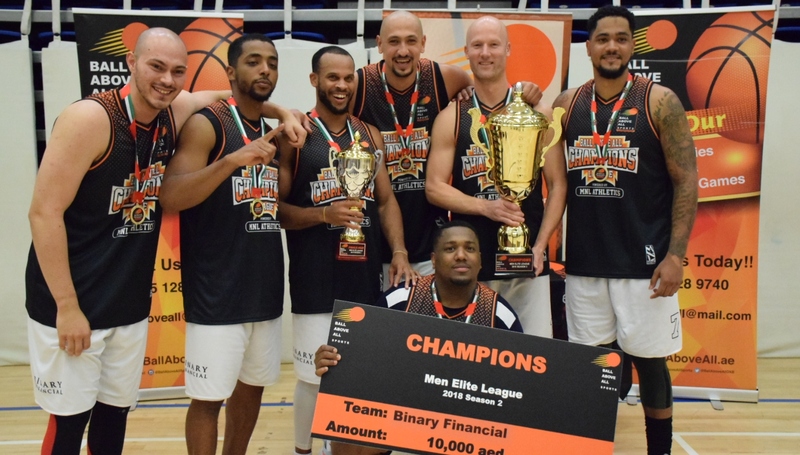 Binary Financial dethroned three-peat champions Vipers in Ball Above All’s Elite League championship to claim the crown, bragging rights and Dh10,000 in cash prize money. Despite UAE national team player Qais Al Shabibi catching fire to knock down 11 3-pointers for 49 points, Binary Financial pulled out a thrilling 98-93 win at GEMS Dubai American Academy on Friday. Amer Al Sati had 28 points to lead a balanced attack for the champions, who also received 24 from Brandon Williams, 18 from Ammar Faroug and 14 from Edmir Lucas. Williams earned Final MVP honours for his all-around game as he contributed 12 rebounds, eight assists, five steals and four triples in addition to his 24 points. For Vipers, Al Shabibi had support from Mahmoud Tarrab, who had 24 points of his own, but no other player reached double figures as their top-heavy scoring punch fell short of a fourth consecutive title. Binary Financial’s Bilal Abdullah, who didn’t play in the final, was awarded Season MVP for averaging 27.6 points, 6.2 rebounds, 6.2 assists and 2.6 steals. During the final, Seyd Diahlo walked away with Dh1,000 for winning the half-court shoot-out, while Kathi Karcher was awarded a GF7X Molten ball for winning the shooting challenge. The season is now over, but basketball lovers can still sharpen their skills with Ball Above All’s four-day clinic, held from July 27-30 between Raffles World Academy and Dubai Stars Sportsplex. Open to both adults and children aged five-plus, the clinic is the perfect for players of all levels. Check out www.BallAboveAll.ae for more information and to register. Mamdou N'Diaye had a triple-double to pace Vipers. A battle of Ball Above All’s the two undefeated teams in the Elite League didn’t disappoint in the fourth week of the season. Dolphins and Binary Financial each entered the meeting with a perfect 3-0 record, but it was the former who remained flawless as they earned a 79-76 victory at GEMS Dubai American Academy Barsha. After the teams went back and forth for most of the contest, Binary Financial held a four-point lead with a minute left. But as they’ve done all season when the game has been on the line, Dolphins came through behind pushes by Augustine Bakali and Pavel Aheunin. Bakali had 28 points and seven rebounds, while Aheunin contributed 21 and five boards to give Dolphins sole possession of first place in the standings. Meanwhile, Heat secured their first win of the season by beating Spartans 80-77 on the strength of Damian Edwards’ 40 points. Spartans’ full-court press proved to be a nuisance for Dubai Heat, who saw their early lead whittle down. However, Edwards responded with timely baskets and Tony Gerges hit crucial 3-pointers in the fourth quarter to pull out the victory. Emmy Unaegbu paced Spartans with 30 points and six steals as they dropped to 2-2 this season. In the day’s other game, Vipers handled Dubai Flights with ease in an 88-65 win. Vipers dominated in the paint and the perimeter as they outrebounded Flight 41-27 while hitting 17 triples, compared to six for their opponents. Eight of those treys came from Alessandro Maniero, who knocked down a season-high, while Michel Hakim had five himself. 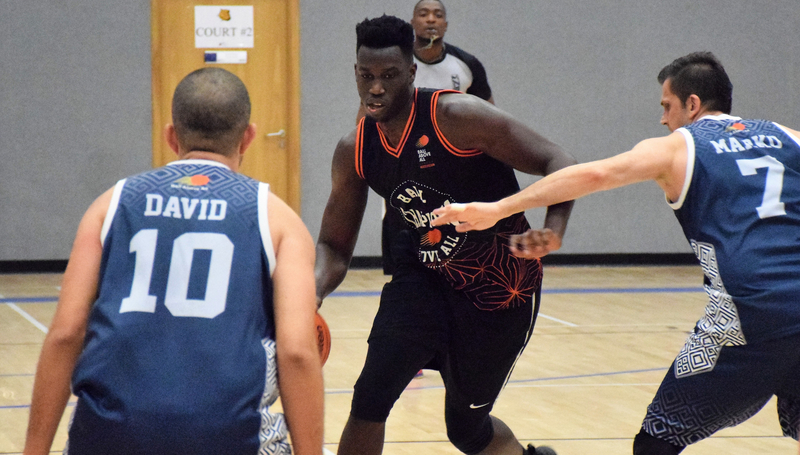 Big man Mamadou N’Diaye had arguably the most impressive performance, however, as he showed his versatility with a triple-double of 17 points, 20 rebounds and 11 assists. Former basketball player Gaafar ElSouri was a dual-sports athlete competing in both basketball and football. Dubai-based since 2014, ElSouri started his career in Saudi Arabia with Al-Hilal club and his basketball career included stints in Europe, Southeast Asia and Canada. A serious knee injury last year left him on the sidelines and needing to rebuild his fitness to get his career back on track. His torn anterior cruciate ligament (ACL) required him to have full reconstructive surgery on his knee, which made him more determined than ever to get back on the court. ElSouri designed himself a workout programme of both fitness and drills to get him back in peak condition. 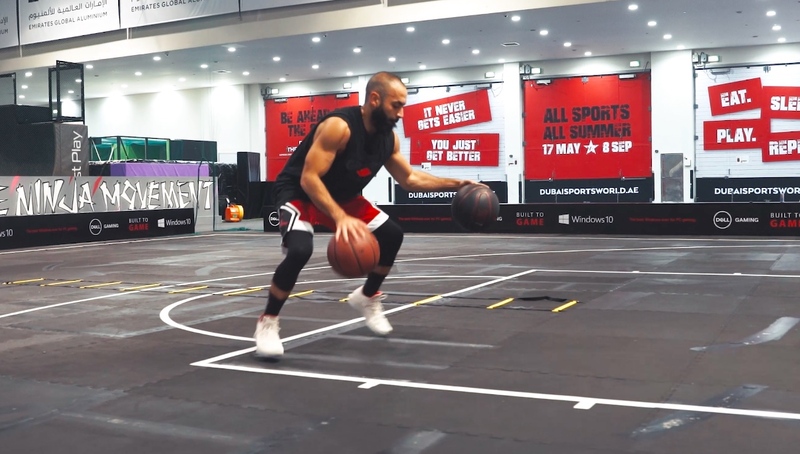 In a series of videos, coinciding with the NBA Playoff finals, ElSouri is documenting his road back to fitness, with the individual exercises you can do to get yourself in top condition. The second in the series focuses on dribbling exercises that aim to enhance your ball-handling skills. These drills can be done as a warm up, prior to a game to get your body ready to be in a triple-threat position. They can also be done to enhance the conditioning of your arms and legs while focusing on ball control. In the pick of the bunch, ElSouri demonstrates figure of eight exercises. You too can practice by standing with your knees about shoulder-width apart and bend over slightly. With the ball in your right hand, pass it between your legs in a figure eight motion to your left hand. Swing the ball to the front and then pass it from your left hand back to your right hand through your legs. As with all ball handling drills, start slowly and increase your speed as you get more comfortable. When you’re confident enough, add in another ball and keep the two going simultaneously. Another exercise ElShouri does is the two-ball front V dribble. Here you move your upper body along with the ball. When you’re doing this drill, it’s important to note the rhythm of the ball. The aim of the exercise is to keep both balls bouncing in front of you, and also passing one through your legs, while remaining in control.